More than 77% of US tour operators participating in the American Society of Travel Agents (ASTA) Destination EXPO 2018 currently underway in Athens, and will travel to other Greek destinations in the coming days, will "sell" Greece through their personal experiences, announced ASTA President Zane Kerby at a press conference with ASTA Chairman Jay M. Ellenby, ASTA Vice President and Business Development Manager Robert Duglin, ASTA Vice Chair & Secretary David R. Hershberger and Greece's FedHATTA President Lysandros Tsilidis. Furthermore, 98% of US delegates intend to use the business contacts they will develop in Greece on the occasion of the conference. Mr. Kerby also underlined that the extremely positive impressions that US delegates gathered from the Athens conference, combined with the overall safety and security of Greece as a destination, the friendly relations between the two countries reinforced by the highly dynamic element of the Greek Diaspora in America, constitute favorable conditions for an escalation in tourist flows of American tourists to Greece in the years to come. This prevailing trend is further strengthened by the increase in direct flights scheduled by US airlines as well as Aegean that have discerned the great potential for growth in US tourism traffic to Greece. 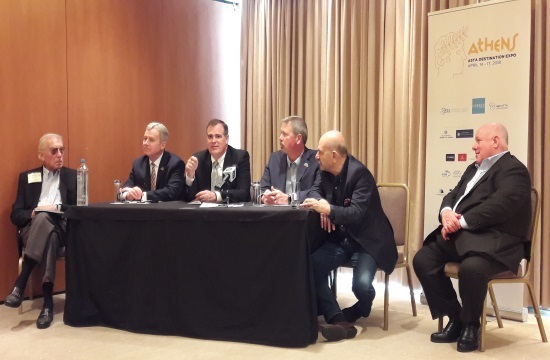 The importance of the ASTA conference on the relations between Greek and American tourism professionals was also highlighted by ASTA's chairman Jay M. Ellenby. Mr. Ellenby lauded Greece and its culture before the US travel agents, noting that the country is incomparable to any other destination in the world, where ASTA Destination EXPO events have taken place. He said that this conference represents the ideal opportunity for US tour operators to get to know Greece with the assistance of local tourism specialists. The great importance of Greek tourism for the US market was recorded during the 1,100 b2b meetings between Greek and American travel professionals that were held during Destination EXPO. Finally, FedHATTA President Lysandros Tsilidis said that the US market already has a history 35 years for Greek tourism. He revealed that the latest preferences include Thessaloniki and Ioannina, while he pointed out that the Americans are making their trips in combination with destinations in the Middle East and the Mediterranean. The US market ranks 11th in terms of arrivals in Greece, but, as far as tourism revenue is concerned, it occupies the 4th spot as American tourists have a high per capita expense. Greece ranks quite high in the sales by independent tourist offices in the USA (NACTA), with the Greek islands attracting an 8% share and Athens included among the 16 most popular destinations, according to 2015 data. Regarding the profile of US travel agencies, group trips account for 22% of their annual sales, and leisure travel occupies an 82% share of total annual sales. Organized holiday packages account for 21% of sales, cruise for 26%, aviation for 20% and hotels to 26%. Nearly 82% of US agents consider fam trips a very effective way to sell a destination. 98% of attendees of ASTA’s destination events plan to use the supplier contacts they gained for future bookings. 94% of attendees of ASTA’s destination events are likely to recommend this event to another agent. Over half of attendees who visit destination events with ASTA say it has increased their sales to that destination. 76% of destination expo attendees are likely to do business with a sponsor because of their presence and in-person meetings with the company representatives at the events. 77% of attendees expect to send clients, or additional clients, to the host destination based on their experiences at the ASTA events. 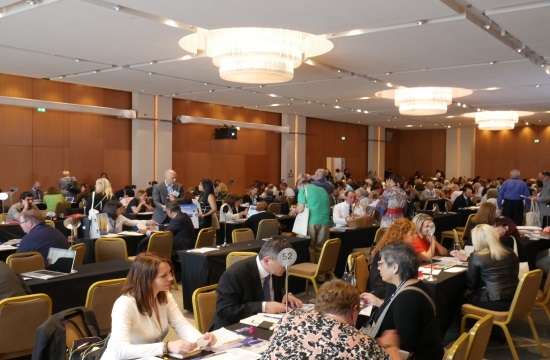 Earlier on Sunday, the American Society of Travel Agents (ASTA) announced the success of the opening session for the Destination Expo in the awe-inspiring Ancient Odeon of Herodes Atticus. President of ASTA Zane Kerby, joined by local partner and president of FedHATTA Lysandros Tsilidis and the Honorable Geoffrey R. Pyatt, U.S. Ambassador to Greece, greeted 300 travel advisors and more than 200 industry suppliers and tourism executives for the sold-out trade show in Athens, Greece April 14-17, 2018. Elena Kountoura Minister of Tourism, who championed the 2018 Destination Expo, presented the honorary opening remarks, highlighting their recent tourism growth, increased hotel development and non-stop air connections from the U.S. through increased carrier relationships. The Greek National Tourism Organization (GNTO) wowed the audience with a performance by famous Soprano Miss Anastasia Zanni, who sang renditions of the Greek and U.S. National Anthems along with the Hellenic Navy Band, which set the stage for many show-stopping experiences to come. “Our mission is to immerse the U.S. travel agent community the local character, natural beauty, flavors and incredible history we have to offer,” said Elena Kountoura Minister of Tourism. “Aiming to establish Greece as a global 365-day destination, we extended the summer season and promoted tourism in the winter season. We introduced new thematic tourism products and new Greek destinations. While Greece is an ASTA favorite, having hosted the event in 1967, 1987 and now 2018, the latest research study, How America Travels, shows that 38% of American travelers wish to “see natural sights” and another 34% of American travelers to “see historic sights” when they vacation, which this destination has the best of both worlds. For more information, visit www.astaade.org and follow the highlights on social media by following #ASTAADE. ASTA Destination Expo (ADE) a unique and face-to-face learning experience that offers participants: current information on industry issues; Access to local and regional contacts; And the opportunity to become highly sought after destination specialists in a strategic, important and growing tourism region. ASTA (American Society of Travel Agents) members represent 80 percent of all travel sold in the United States through the travel agency distribution channel. Together with hundreds of internationally based members, it is the leading global advocate for travel agents, the travel industry and the traveling public. ASTA’s history of travel industry advocacy traces back to its founding in 1931 when it launched with the mission to facilitate the business of selling travel through effective representation, shared knowledge and the enhancement of professionalism. For more information, visit www.ASTA.org.